Quality Bicycle Products (QBP) of Minnesota determined that they required a permanent home for their fourth facility, and decided on Lancaster County to be the home of ‘Q-East’. Greenfield Architects designed this distribution facility to be located on the site of Lime Springs Farms, East Hempfield Township, Lancaster County, Pennsylvania. The 121,000 sf facility includes a 10,000 sf office and 10,000 sf mezzanines. 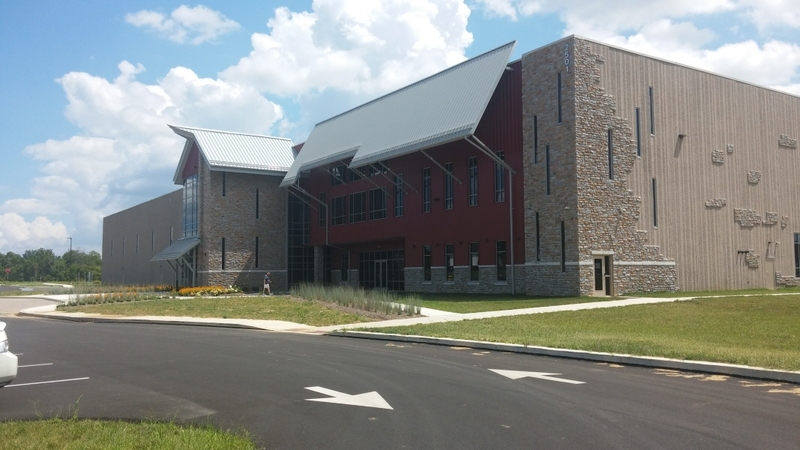 The entrance/office component projects from the body of the building with a striking barn-like imagery compared to rest of the concrete panel façade. The transition is made between these volumes by extending the metal siding, roof and stone veneer from the office to the warehouse’ concrete panels. Inside, The program inside includes men’s and women’s locker rooms, side door access for cyclist employees, large lunchroom, training room, small conference rooms, and open office space. The mezzanine contains open office, large conference room and toilet rooms; access is provided from the first floor via a monumental stair and passenger elevator. The distribution center contains a dozen inbound and outbound docks, high-bay and lower high-piled rack storage, a packing area and a conveyance system (by an outside consultant to the owner). The interior is well lit by skylights and high clerestory windows. The building uses an early-suppression, fast-response sprinkler system with a fire pump. The bulk of the employee and guest parking are on the front north side of the building. The site will have ample truck access and parking and two detention basins and a rain garden for water quality management. The building is designed for a future 80k sf. expansion to the east. This will increase the hi-bay racking area that comprises a third of the building.